Johnny Moss is well known as long-time gambler and professional poker player. He grew up in Dallas, Texas and as a teenager worked at a local gambling parlour. He learned how to gamble at a young age and others helped him how to cheat in games. His job there was to make sure games carried on smoothly without any cheating. This is when he learned how to cheat at cards himself and picked up the poker strategy tips that he used later on during his poker career. Back then, Johnny was one of the original road gamblers as he travelled from towns to cities around Texas and the Southwest. He played high stakes poker during backroom games as this was a time when gambling was illegal in the States. The life of professional gamblers had to be on the road rather than in one place to keep away from the police officers, mobsters, criminals and Texas Rangers who were constantly following them. His career started before the advent of major tournaments and legal casino poker rooms, so like most professionals of the time, he had to be a travelling gambler making a living on the road. Early on in his poker days, Moss like many others carried a pistol. While playing in a backroom he observed a peephole in the ceiling through which the house was spying on the card players. Moss told them that if they didn’t send the spy down and plug up the hole, he would be forced to open fire on them. The owners played dumb, thinking he was bluffing, forcing Moss to prove he was serious by firing a few rounds into the ceiling and actually wounding the man hiding within. After this enduring match, poker became popular, and eventually the first WSOP was organized. Moss won the 1970 WSOP and was actually voted the champion by his peers and only received a silver cup as his prize. He was one of the charter inductees to the Poker Hall of Fame in 1979, one of the charter members at Binion’s Horseshoe Casino. In those early days, poker players did not have today’s resources, no strategy books on poker so Moss’ only guide was overseeing local poker games that allowed him to develop much of the strategy and many of the insights that made him such a successful player. He played at every WSOP from 1970 to the 1995 World Series and during his career he won 8 WSOP bracelets, placing him fourth overall behind Johnny Chan and Doyle Brunson 10 each and Phil Hellmuth’s 11. During his career he won over $680,000 in tournament play. Johnny Moss was a huge proposition gambler. He won millions of dollars betting on his personal bowling and golf matches. He once claimed that he lost over $8 million in four years of shooting dice. Unfortunately, he lost it all at various sports books and at the craps table. 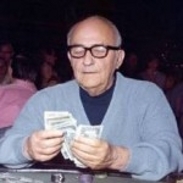 It is said that if the WSOP had commenced ten years earlier, Johnny Moss could have easily won five or six more World Championships. He even has a starting poker hand named after him ‘the Ace-Ten’. There are few characters in the history of poker that have done more for the game than the great Johnny Moss. Winning three of the first five WSOP Main Events and achieving eight WSOP bracelets, Moss was a force to be reckoned with on the felt. Moss was born as a true rounder and bred in the old school when players carried pistols in their waistband and things like endorsements and websites were things of the future. Although Moss enjoyed the bulk of his success at the poker table, this was not the only arena in which he was both feared and respected. He claimed to have won millions on golf courses and in bowling alleys. Despite his many triumphs, like most people, he was not without his failings, losing more than $8 million betting on dice and sports. He eventually gave up these vices as well as his cigarette addiction and enjoyed an overall better quality of life during his last years. Many argue that Johnny Moss was the best poker player of all time and during the end of the 80 s and 90’s there were only few players who could compete with Johnny Moss, thus the name “the best player of all time” as one of the greatest poker players period.